Great for your Home, Patio, Boat, Bar, or Office! These beautiful Brass Anchor Lanterns are working handcrafted reproductions in heavy brass cast hardware with repaclable wicks. Fantastic emergency storm lighting, does everything the hurricane model does and more. The Anchor Lamp Stands 13" tall without the handle and is 6" wide. The oil burning pot and wick unit are serviced from the bottom of the lantern and can be converted into an electric fixture with great ease. There is room inside for a full size light bulb after conversion. 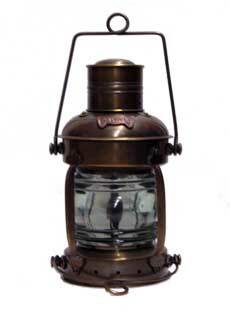 Some the applications that our Anchor lamps have been used for include, ships wheel chandeliers, exterior lighting on property, ceiling fixtures, end table lamps and also make a perfect patio/deck oil burning lantern. The lamp is very sturdy and weighs nearly 8lbs.